Think of your lungs as a balloon in a box. Normally the balloon completely fills the box, but if air gets into the box, it pushes the balloon inwards. In the same way, air can get into the chest from a leak in the lungs. It can also get into the chest from outside the lung. This could be due to a chest wound during a car crash, for example. This causes part of the lung to collapse, making it hard to breath. A collapsed lung is also called a pneumothorax (new-mo-thor-ax). A collapsed lung can be caused by injury but it often happens when you get a small tear in the lining of the lung for no known reason. This is called a "spontaneous pneumothorax". Tall, thin people are most likely to get a spontaneous pneumothorax. It is also more common in smokers. 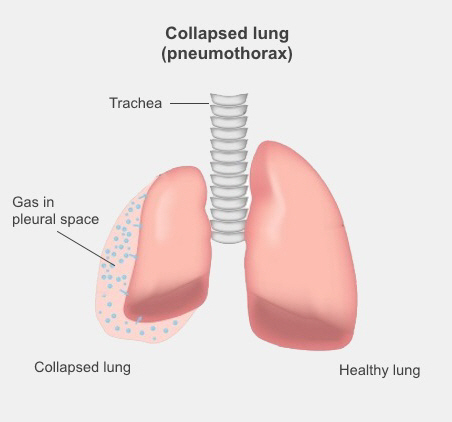 Sometimes a collapsed lung is caused by a lung disease, such as chronic obstructive pulmonary disease (COPD, also known as emphysema or chronic bronchitis), lung cancer, or pneumonia. How do I know if I have a collapsed lung? If you have a collapsed lung you will be short of breath and feel a sharp stabbing pain that is worse when you breathe in or cough. Usually doctors can diagnose a collapsed lung with a chest X-ray. If you are worried you have a collapsed lung you should see a doctor immediately. How is a collapsed lung treated? Usually, if the air leak is small, your body will reabsorb the air and heal the tear by itself. This may take anything from a few days to several weeks. Sometimes the air leak is larger and you will need help to remove some of the air. In this case you will have to go to hospital to have the air removed. First you will have a local anaesthetic to numb the area so the procedure doesn't hurt. Then a doctor will insert a needle into the space between your lung and chest wall to draw off the air. Occasionally an air leak is large and persistent so the air needs to be removed with a chest drain. If this happens to you, you will probably need to stay in hospital for a few days until the air has been drained and your lungs have healed. Although most people who have a collapsed lung don't experience it again, in some people it happens repeatedly. If this happens you will need to see a hospital specialist who may recommend an operation to stop it from happening again. This operation is called a pleurodesis. The surgeon will make the lining of your lungs (the pleura) stick together, either by using a special chemical or by irritating them physically. After this, air leaks will not be able to happen. This procedure will not affect the way your lungs work. After you've been diagnosed with a collapsed lung it is important not to fly until your doctor is certain that the pneumothorax has gone and has cleared you to do so. It is dangerous to fly with a collapsed lung because the air pressure around your lung doesn't drop when the cabin air pressure drops. This can make the pneumothorax get bigger, or damage the surrounding tissue. If you scuba dive or freedive for sport, you won't be able to again, even after your lung has healed. This is because of the risk of your lung collapsing again when you are under water. If you dive as part of your job, talk to a dive doctor about possible options. This page describes the different causes of a collapsed lung, and the treatments.